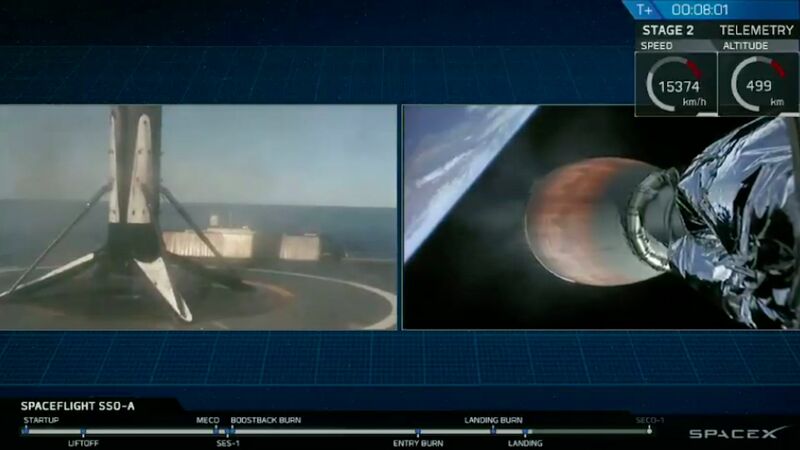 SpaceX Falcon 9 booster successfully landed on the drone ship (left), while the second stage of the rocket continued into space for deploying a record 64 satellites into low Earth orbit (right). Credit: SpaceX. Why it matters: Reusing rockets is central to SpaceX's business plan for lowering the cost of access to space. Until Monday, the company had not relaunched a Falcon 9 rocket that had already been flown into space and then returned to Earth more than twice. Details: The tiny satellites hitching a ride aboard the SpaceX rocket include 15 microsats and 49 CubeSats operated by government agencies, commercial companies and educational institutions. They include technology demonstrations and imaging satellites from 17 countries, including India, Jordan, Kazakhstan and the U.S.